Overshot is the most American and most Canadian of weave structures. I’m not saying that the U.S. and Canada are the only countries that can claim overshot or that they invented the structure. What I am saying is that weavers north and south took the overshot drafts brought over from Europe and made them their own. To understand the reason for overshot’s popularity, you need to understand the weavers of pre-Industrial Revolution America and Canada. With the exception of those who worked on luxury, specialized fabrics, most weavers made household linens. The cloth needed to be strong and serviceable, and there was little room for experimentation or creativity—except, of course, for coverlets. Coverlets were functional items, but they also served the purpose of decoration. So, weavers of coverlets were free to play at the loom—and play they did. The reason that weavers loved overshot then is much the same reason that many of us love it now—it’s a simple structure that produces complex patterning on just 4 shafts. With overshot, you can create circles, stars, flowers, and more. It’s also easy to take a draft and adjust it to create seemingly endless variations, which is exactly what happened during the 1700s and beyond. Household weavers would riff on drafts to create new designs, give them names, and then share the drafts with other weavers near and far. As you might expect, it was not uncommon for multiple weavers to “discover” the same draft without realizing it, nor for them to assign it different names. These names sometimes described what the weaver saw in the pattern—and, often, weavers saw very different things. Take, for example, Marguerite Porter Davison’s Ancient Rose pattern: In other texts, it’s known as Chariot Wheels. On a more whimsical note, Governor’s Garden was also known, at one point, as Rocky Mountain Cucumber because, apparently to someone, the design looked less like flowers and more like a cut cucumber. 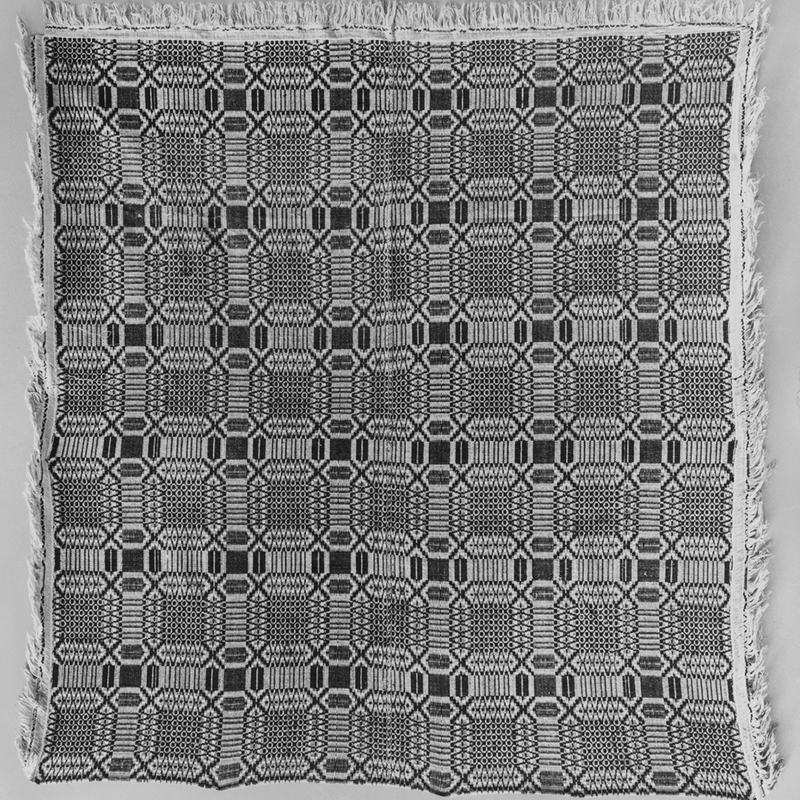 A coverlet from The Metropolitan Museum of Art’s collection woven in a pattern with many names including Governor’s Garden and Rocky Mountain Cucumber. Other names seem to have nothing to do with the pattern itself but, rather, reflect the time or place the pattern was designed. The draft for Lee’s Surrender, for example, came sometime in the aftermath of the American Civil War. Specifically, legend says it was designed by a Confederate mother mourning a son lost in battle. In fact, you can find more delightful stories and names in Hall’s book, which is available for free here. The book, which contains a wealth of information on traditional coverlets and designs, is well worth a read. For further reading, I have to suggest Ozark Coverlets: The Shiloh Museum of Ozark History Collection, by Martha “Marty” Benson and Laura Lyon Redford (affiliate link). It’s my favorite book on coverlets, and it beautifully covers (no pun intended) the history of Ozark coverlet weaving and the lives of those weavers, and, best of all, it includes modern drafts of the designs. 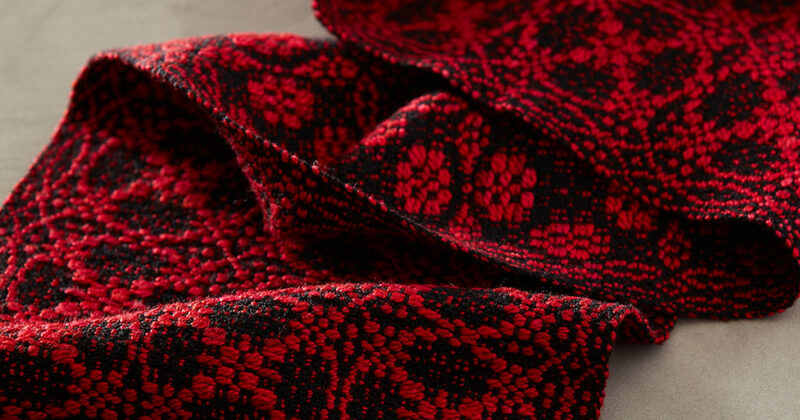 Featured Image: Scarf woven by Christina Garton in either the Ancient Rose or Chariot Wheel overshot pattern, depending on the draft source. PHOTO BY GOERGE BOE.